The LG G Pad 8.3 is certainly one of the most compelling tablet choices on the market right now. It's among a special few to offer Full HD resolution on a sub-9" tablet, and has an excellent design to go with it. The lightweight and thin construction also make handling a breeze. But a few sacrifices had to be made to hang a competitive price tag on that package. Most notably the Snapdragon 600 chipset, which while pretty snappy at this point raises a few questions about future-proofing. The dropped NFC support and, of course, network data. The midsize tablet market has a few convincing alternatives, most notably in the form of Apple's new iPad mini with Retina display. The just-announced device is smaller and thinner (but wider) than the G Pad, and sports a 7.9-inch display of 1536 x 2048 pixels resolution that results in higher pixel density. It also has a slightly faster chipset with the new A7 sitting under the hood. The Retina iPad mini has a far larger number of tablet-optimized apps to rely on, but even the base model is in a higher price range already, even if you can settle for 16GB of storage. There's no expansion slot there, so realistically you'll have to part with about €150 more to own the Apple slate. So while the iPad mini is probably the superior tablet, it just doesn't offer the same value for your money as its LG rival. Google's 2013 edition Nexus 7 is also a serious contender in this category, as it sports the same screen resolution panel on a 7-inch diagonal, which allows it to match the pixel density of the iPad mini (not that the G Pad screen isn't sharp). Like the iPad mini you'll have to make do without a microSD card slot and IR-port, and the chipset is clocked lower than on the LG slate. That said, for the same price as the G Pad 8.3 you could get a Nexus 7 with 32GB of storage andLTE support. And you'll be sure to receive future Android updates in a timely manner, even if you will be skipping on the extra functionality brought by the LG custom launcher. The Nexus 7 is perhaps the biggest obstacle the LG G Pad 8.3 faces - cheaper and matching it for both performance and resolution, the Nexus slate seems like the more reasonable purchase. It only has a 7" screen, though, and we are sure many will find that insufficient. Amazon's Kindle saw a major upgrade this year, and the latest Kindle Fire HDX comes in two sizes - 7" and 8.9" screen diagonal. 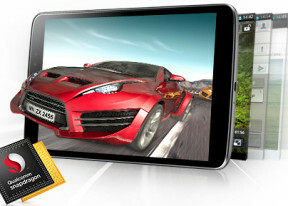 They both have above Full HD resolution and a very powerful quad-core 2.2 GHz Snapdragon 800 processor with Adreno 330 GPU. You'll be giving up expandable storage, and, more importantly the Play Store access, which puts those two in a rather different niche. No self-respecting comparison would be complete without Samsung chiming in in some form, in this case with it's Galaxy Note 8.0. LG may be targeting the iPad minis but at least a corner of an eye is on Korean neighbors. The Note 8.0 comes in thinner and shorter and has the exact same weight of 338 grams, but is almost 10mm wider and the screen bezels are much larger. The 1.6GHz quad-core Exynos chip inside is starting to show its age and the screen is of far lower resolution. What the Note tablet does have however, is network connectivity (including an LTE variant), along with Samsung's excellent S-Pen stylus and supporting apps for about the same price as the Pad 8.3. We'd still say the LG slate is the far better value here, though. The LG G Pad 8.3's story is written by its crisp display, capable chipset, and compact design, which almost stand for the pinnacle of LG's mobile tech. Obviously, the lack of network support relegates this to a living room tablet, which is why a more complete QRemote app would have been better (not just for TV's and set top boxes from predefined manufacturers). Despite these shortcomings though, the capable software package and powerful hardware are enough to make the Pad 8.3 a strong competitor. The fact that LG was able to fit all that into such a compact package is impressive in its own right, and there are even hints of an LTE version in the works, so maybe you will be able to have it all.